This is not a post I wanted to write. But I had to pass along this information. All year I'd been looking forward to June. After a very busy school year, we'd all be home and able to enjoy the lazy, hazy, crazy days of summer. Right? The problem started when our home phone suddenly stopped working. We all have cell phones, but we also have a land line. Our EMS folks recommend land lines because they enable quicker response times from emergency personnel. We have enough medical issues in our family that quick response times are very important to me. Anyway, our land line phone just stopped working. Puzzled, I called the phone company. They checked our account and told me that service for our home phone number had been switched to another provider. Huh?? I knew that couldn't be right--I hadn't requested such a change, and neither had my husband. So the phone company told me they'd check into it and get back to me. Several days passed with no results. I contacted the phone company again; this time they told me that they would issue us a temporary phone number so that our service could be reinstated and put in a request to get our old phone number back. More time passed. Our home phone began working again with a temporary phone number attached. But we wanted our old number back. It had been our phone number since 2001, and it was attached to records of every sort. Finally I called our phone company again, determined to persist until I got to the bottom of the situation. This time I got a customer service representative who took me seriously when I told her that I had not requested a change of service. She asked me to hold while she did some research. While I was on hold, she called our old home phone number. And a woman answered the phone. "May I speak to Richella?" the phone company rep asked. The woman replied, "This is Richella." Thinking quickly, the phone company representative said, "I'm sorry; I thought you were having trouble with this line." The woman answered, "Oh, no, it's working fine. I switched this number to my cell phone." The phone company rep hung up that call, then came back to the line on which I was holding the whole time. Whoever answered that call and claimed to be Richella, it wasn't me. Someone had taken our phone number and was now using it and claiming to be me. Things then started happening quickly. The helpful phone company representative provided me the name of the wireless company to which my old number had been transferred. I called that company and was told that all the proper procedures had been followed for the transfer of service. When I insisted that I had not authorized the transfer, they simply repeated that it had all been done according to procedure. Can you believe that? Someone had stolen our phone number. Did you know it was possible for your phone number to be stolen? I sure didn't! My next call was to the police. A very nice officer drove his squad car to my house (I'm sure the neighbors loved that). He took my report and opened an identity theft case. At that point, the only thing that had been stolen was my phone number, and we had no idea what use a thief might make of it. The officer suggested that I contact my financial institutions and that I monitor all my accounts closely and to let the police know of any suspicious activity. I began the arduous process of calling our financial institutions and having security alerts placed on all our accounts. I had been at it for about two hours when my husband's cell phone rang. The caller was a teller from a Suntrust Bank in Florida. She asked my husband a couple of questions to verify his identity, then she informed him that a woman at her teller window was trying to cash a check on one of our accounts in the amount of $5,000.00. Of course, we had not written a check for $5,000.00. Turns out that thieves had somehow gained access to one of our bank account numbers. 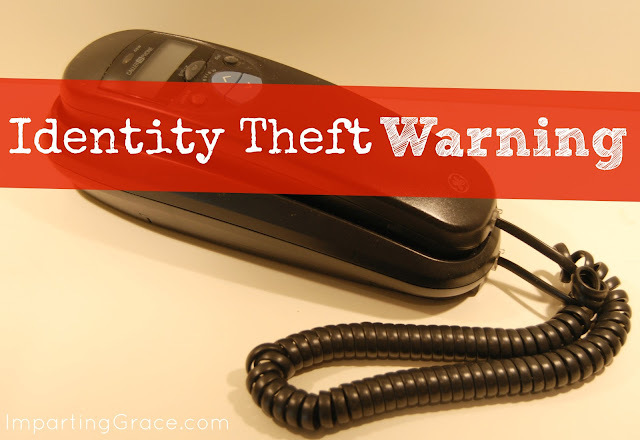 They had stolen our home phone number, knowing that our bank would call our home phone number to verify a check. One of the thieves took a counterfeit check to the bank and tried to cash it. The teller did in fact call the home phone number on record to verify the check. A second thief answered that call, identified herself as me, and said that yes, the check was valid. By the grace of God, the security alert on our account caused the teller to double-check the signature on that check against the one on file. When the signatures didn't appear to match, she called the next phone number on file, which was my husband's cell phone. While my husband was on the phone with the teller, the bank manager notified the police, who came and took the thief into custody. Imagine me, listening to my husband's side of the conversation. Just everyday statements like "So the police are there now?" "And they've placed handcuffs on the woman. Okay." I felt as though I were in a Reader's Digest "Drama in Real Life" story. So the saga continues. I'm still trying to untangle the mess. Police here in Durham and in Florida are working on the case. Bank officials have been working with me to make sure our accounts are safe. I'm slowly but surely getting all our records changed to the new phone number. And we're wondering what other information the thieves might have stolen. Here's what you need to know. Unless a special order is in place, your phone service can be "ported out" to another service provider very easily. This is quite handy if you want to change phone service providers; all you have to do is provide your name, phone number, address, and the answer to a simple security question such as your birth date, and go through a brief "third party verification" process. Unfortunately, a thief can provide all that information and have your phone service "ported out" to another provider as well. Turns out that these thieves are quite willing to go through all the proper channels to steal your information, and the protocol in place doesn't account for the fact that the person requesting the change in service might be a liar. Whatever phone number you use for account identification (land line or cell phone), you should protect that number by calling your phone company and having an order put in place that will prevent your phone service from being ported out to another provider without your express authorization. With my phone company, this is called a "Freeze Order" or a "Do Not Port" order. With this order in place, your phone company will not allow service for your number to be transferred to another provider unless they call you to verify that transaction. I won't say that identity thieves are smart, for if they were smart they'd have some moral knowledge. But they are clever. And patient. And bold. And they know how things work. I refuse to live my life in fear of them, but I've learned the hard way to be vigilant. I urge you to do the same. Call your phone service provider and put in an order to protect your number! Have you ever been the victim of identity theft? Or do you have any tips for protecting yourself? Please share! I'm joining Emily at Chatting at the Sky for her "What I Learned in June" party. This lesson was a hard one! Richella, I am so sorry this has happened to you. My in-laws had their identity stolen. It took a while but things are back to normal. I am thankful the person in your case was caught and hope and pray that justice will be done. Sending you a great cyber hug! That is so scary! We've had fruad issues through paypal twice before & I know how nerve wracking getting things that you didn't authorize straightened out can be. You made me just do the free annual credit reports for my husband & I both. It's something I try to remember to do yearly & had been meaning to get around to it this summer! Thanks for speeding up that process for me! Good luck with keeping all this identity theft under control & thank God for the smart bank associates & helpful police! oh mercy me.. I am so sorry this happened. thanks for the tip.. I'll be telling everyone I know. Wow. Sorry this happened to you but thanks for sharing your experience. This is good info to know. I lovr your blog by the way! My 84 yr old mom got involved in a money scam totally innocently. She began filling out every sweepstakes entry that came into her home and ordering things. A man called her and told her that she had won a car but needed to send him $1,500 to pay the taxes. Luckily she didn't but he then began to phone harass her, calling up to 30 times a day on her cell and landline. We got the local police involved and had to shut off both phones for a period of time. I fear this is not over yet!Such a shame there are people who get their kicks preying on others! Thank you for sharing your information! Oh Richella, how terrible! This world has just gone crazy. What a pain, and it is so sad that so many cooks just want to take what is not theirs. We must do all we can to protect ourselves from this problem that is happening way too often. You do need a vacation!! I'm so sorry that happened! I'm going to share this information with my husband. Thank you! Sorry to read about your troubles. You are very lucky that your land line telephone company was so helpful! When many of our friends and family were getting rid of their land lines, we held onto ours for years for the same reason. We wanted the fastest possible 911 response time. But our land line company (formerly Verizon, now Pioneer) was so difficult to work with that after spending nearly 4 hours on two separate occasions on hold and being transferred to one department after another, I decided that we just don't have the kind of time on our hands that it takes to manage our local land line service company! Thanks for the warning about identity theft though. Valuable information. Good luck! Glad you wrote it, Richella. This could help a lot of people. Thank you so much for sharing this important info Richella. i'm so glad they were able to catch them. That doesn't happen often. Wow, what a story! I thought that identity theft was usually related to social security numbers, I had no idea a phone number could be stolen. You were wise to put the alert on all your accounts, I would not have thought of that.Thanks for the heads up! That is AWFUL! You have really been targeted, I'm so sorry. Glad it is all okay!! Richella, I am so sorry about all this turmoil. How disturbing to know that your life can so easily be invaded. Scary! I am so glad you were able to get it all resolved before you actually lost money, and that the culprits were caught. Thanks for the suggestions to prevent it from happening to someone else. I will take care of it tomorrow. Wow! I am sorry you had to learn that lesson but grateful you are passing it on to help the rest of us. And here I had to be on the phone for an hour trying to cancel my folks' phone service after my dad died, as my mom was moving in with us. They wouldn't cancel it without my dad's authorization because it was in his name. I said "I just told you. He's dead" and she said she knew that but still needed his authorization. Even my mom, his wife, couldn't authorize it. An hour and FOUR people later they finally agreed to accept his death certificate! So I bet that's one phone company that won't easily accept someone's desire to transfer something! I went through your article. This is one of the great tips which I didn't know before and I would surly share and follow this one. I am so sorry, and I will be calling our phone company. Thank you for sharing this. Wow! You've been victimized multiple times now, Richella, and this just boggles my mind. Thank you for this tip; I had no idea. I'm grieving with you over the hassle you had to endure. So glad it got worked out to a good end. What a nightmare. So sorry you've been thru this. Thank you for sharing the tough stuff along with the beautiful. You've made us wiser! Sorry to hear this... This just happened to my in-laws. The person actually changed her number twice...what a mess! Glad they were able to catch the person! Oh my. This is so scary Richella. I am so sorry this horrible thing happened. Thank goodness that the teller decided to double check.. I felt very sorry for you, that you have gone through this nightmare. Thanks for sharing this post with great tips. This is going to help a lot. Good heavens, Richelle! It is amazing that there are so many people who figure out how to steal. Imagine how much good people could do if they used their imaginations and skills for good! So very glad you were able to catch this thief! In April, 2 different credit cards were opened in my name. The cards arriving in the mail is how we discovered it. One had two charges on the same day - mail order, over $1000. The other had no charges. The police took the report, but the businesses are trying to recover their money. All the information they had was correct except my mother's maiden name. So far, just the alert on our credit report is what we have in place. We hope it goes no further. Oh my goodness! Didn't this happen to you a year or so ago as well? I am so sorry you've had to go through this, but also thankful that those thieves were caught. Thank you for sharing your experience--I am sure this story will help many people. I am so sorry you had to go through this!!!! ugh! but good info about the phone company. I am so glad it stopped there!!! I am so sorry that you are going through this! Thank you for sharing your experience: I hope it helps someone. I remember reading in a magazine (years ago - when identity theft was just starting...) where someone's purse had been stolen. The purse thief took the money, credit cards, checkbook & driver's license to do regular fraud stuff. But, they also SOLD her social security number into the "black market" where a woman in another state used it to get a job at Taco Bell. She worked there for long enough to generate a W-2... & then didn't file a Federal Tax Return. The IRS came after the woman that the social security number belonged to: it was HER burden of proof that they required in order to not pay the taxes. It showed her sitting beside this huge stack of paperwork & told how many thousands of dollars it took to fix that.